MOORESVILLE, N.C. — A live interview with 2018 Drive 4 Diversity Combine participant Ryan Vargas and audio from newly-minted Richard Petty Motorsports driver Bubba Wallace headlines two hours of short track racing news and analysis on Race Chaser Online’s Stock Car Show, airing every Thursday night at 7 p.m. ET on the Performance Motorsports Network. 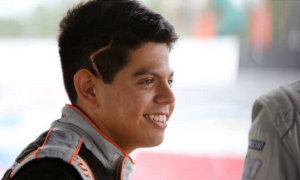 Vargas joins the program to recount his experience with NASCAR’s diversity effort and discuss his hopes of being selected as one of the program’s drivers for the 2018 season, while Wallace speaks on the “honor” of being chosen to drive the famed No. 43 car in the Monster Energy NASCAR Cup Series as he pursues Sunoco Rookie of the Year honors next season. In addition to hearing from both drivers, Race Chaser Online analysts Tom Baker, Jacob Seelman and Cisco Scaramuzza will break down the ARCA Racing Series finale at Kansas Speedway and Michael Self’s long-awaited first win in the series, as well as preview the final countdown to the NASCAR K&N Pro Series West championship with one race to go in the season. Other topics of discussion will include the 2018 CARS Tour schedules for both the super late models and the late model stock cars, as well as the Tri-Track Open Modified Series and Keith Rocco’s Connecticut SK Modified championship sweep with New England racing analyst Kyle Souza and a ‘Fit Stop’ with Race Chaser Online motorsports fitness correspondent Hunter Smith.